This Tool is an enterprise level system for managing Human Resources. 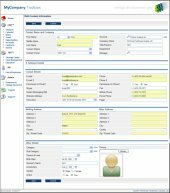 The Tool ties contact management features to the employee database for single-entry record keeping. The system is used for creating permanent employee records of everyone in the company, employees, contractors, consultants, and business owners. The system has a built-in Employee Review system, Employment Information records, employee information records, and official employee notes. This information is all the basic information that is found in the Contacts section of the Toolbox. These are items like email, telephone, Skype, fax, addresses, birth date, gender, spouse's name, and wedding anniversary. This screen has a multitude of contact information that is found in the majority of the desktop CRM software packages such as Microsoft Outlook. This page has personal details about the employee that are necessary for payroll, benefits, and insurance reasons. This Tool gives the managers, supervisors, and executives a quick and easy way to add notes to an employee's file. The notes can be commendations, warnings, or disciplinary notes. This creates a complete file for the employee. This screen shows the easy accessible and format ready utility to create well formatted employee file notes. The review system captures all the employment reviews with: next review date, review type, rating, salary change, reviewer, and comments. The system also allows file uploads for inclusion of electronic copies of the corporate review forms. This page allows you to set the user’s system permissions. This is to control the access the user has on viewing other employee records and other sensitive portions of the system. This page is used to record employment history such as the position occupied, pay rate, status, and annual pay. It makes it easier to determine pay increases, bonuses, and other benefits and rewards. This page is used to edit the employment history to reflect pay rises, position, and other employment information. This makes it easy to enter permanent records for later access.